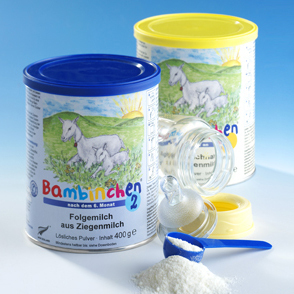 Bambinchen can be given on its own as baby formula or as a great supplement to breast milk, if breast milk quantities are inadequate or other reasons require it. To ensure breast milk continues to be produced, it is advisable to always first put the child on the breast before feeding him/her the bottle of Bambinchen. If Bambinchen consumption results in constipation or hard stools, simply add a teaspoon of cold-pressed sunflower oil (olive oil, rapeseed oil) – always certified organic – to each bottle. In most cases, stools will normalise within a few days. Intestinal flora is often affected by antibiotics, unsuitable baby food, etc. Probiotics are recommended in such cases. Simply add a pinch of probiotic powder to each bottle. Omega-3 fatty acids are particularly important for early childhood development, which is why it makes sense to occasionally add a teaspoon of it to your baby’s bottle (Omega-3 oil, fish oil, krill oil). Anyone wanting to avoid giving their child synthetic vitamins can feed him/her (from the 6th month onwards) natural vitamin D compounds.